I wrote a series titled Farm to Fork detailing my visits to Ann Arbor, MI farms and could not resist the pun reversal. My grandparents on their farm taught me to take the byproducts of cooking and feed them back into the soil. Every two or three days a bowl – of eggshells, mussel shells, onion skins, zucchini ends, apple cores, lettuce ends, etc. – was dumped on a pile of weeds and leaves. Once a summer my sister and I would be instructed to “turn” the pile over onto an adjoining space. 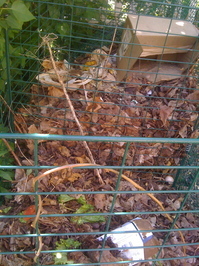 After a full winter the two-year-old compost would be spread back onto the garden. This is the system we use in our garden today. According to the EPA’s Municipal Solid Waste Generation Report (2008) the average person throws away 4.5 pounds of trash per day. Of that trash, 12.7 percent is food scraps, 13.2 percent is yard trimmings, and 31 percent is paper – which means that 56.9 percent of our trash can be composted. Composting removes that waste from landfills, reduces air pollution from burning the debris, and improves the soil – it is a win-win. The pile of compost gentle deteriorates in the weather. There are several different ways to deal with food scraps, each one appropriate for whatever space or time constraints you have: cold composting, hot composting and vermiculture. The point of composting is to allow organisms (bacteria, microbes, worms, etc.) to break down organic matter into humus. Humus is the finished stable product of composting and is wonderful fertilizer. 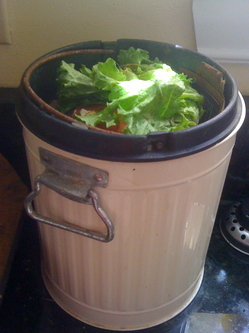 Cold composting is for those with a lot of space, time and little desire to futz with the pile. It is what my grandparents did and what I do. It does not look very attractive, but is very easy and is manna from heaven for plants. If you are inclined to create a hot compost pile in your garden you will need a container that allows airflow and maneuverability, because you will be turning the contents every 5-7 days to allow in oxygen. The ideal ratio of carbon (brown dead material: wood chips, shredded cardboard, sawdust, shredded newspapers, etc.) to nitrogen (green recently live material: weeds, meal waste, grass clippings, etc.) is 25:1, which usually equates to 2 parts brown material to 1 part green material. Hot composting is the method whereby the pile is constructed all at once and monitoring of the moisture content is necessary to make sure that it does not get too wet or too dry. There are many containers available in the market place to make it easier to compost this way. Kevin Dorn recently spoke about this in his community post. A handful of yummy worms from our vermiculture bin. The method I was the most excited to learn about during my Master Gardener Class was vermiculture. 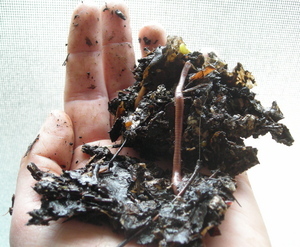 Vermiculture is the practice of worm composting, which can be done inside in a rubber container. It is perfect if you live without access to an outside space. I was very curious to learn more and thrilled when I met the ladies in charge of the The Worms Do It at the Plymouth Green fair last year. Yes, I could have constructed the worm composting system myself. I could have schlepped to a store, purchased a large rubber container, drilled holes in it, ordered some red wiggler worms online or visited a bait store, but I chose not to. I bought one ready-made from their booth at the fair and talked a friend into doing the same thing. Double wow, indeed. From fork to farm. This entry was posted in On the Farm and tagged compost, composting, Corinna Borden, Real Time Farms, Vermiculture. Bookmark the permalink. So excited that YOU are so excited about worm composting.